For $100, you can have your name engraved on a seat in the Westbrook Performing Arts Center. 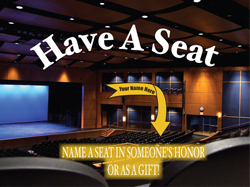 Name a seat in someone's honor or as a gift! Your tax deductible donation generates much needed funding to ensure the facility remains a state-of the art theater.